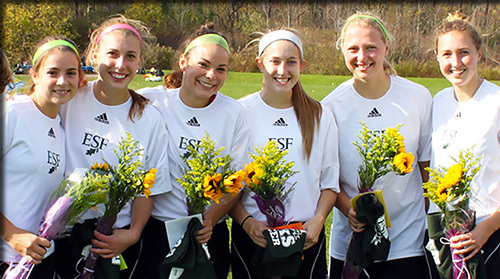 The ESF women's soccer team will travel to Charleston, W. Va., as the #2-seeded team in the 2014 USCAA Soccer National Championship. The women will play Nov. 6 against the winner of the #7 (Christendom College) and #10 (Bryant & Stratton - Syracuse) game. The Mighty Oaks finished the season with a 12-1 record. Their only loss came at the hands of #1 seed University of Maine - Fort Kent, 3-2, in overtime. The Mighty Oaks are led by senior Bridget Cuddihy with 17 goals and sophomore goal keeper Kiki Hilmer who boasts a .887 save percentage and 4 shutouts. "We had a great season, I am really excited about being the number 2 seed. It was a real pleasure playing with our seniors this year. I hope we can come back from West Virigina with a championship," said Hilmer. Fans can Follow the women's soccer team throughout the tournament at esfathletics.com as well as on Facebook and Twitter.